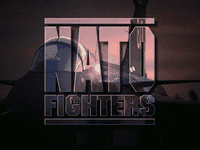 Take command of the skies over Europe with NATO fighters, an enhanced add-on disk for Advanced Tactical Figher players. Climb in the cockpit of an F-16 Fighting Falcon and blow MiG'sout of the sky as you attempt to thwart Russian aggression over the Baltic republics amidst high intensity air combat. 4 new planes: F-16 Fighting Falcon, Saab Gripen, EuroFighter 2000 and Su-35. New weapons/ More targets - Take out those parked aircraft with cluster bombs, or use backfiring missiles to wipe out the MiG on your tail.